All music lovers will find something they like at the audiophile premium label Coviello Classics. There are no stylistic limitations or reservations: quality is the sole criterion. Every recording breaks new ground: new discoveries are made from previously neglected repertoire and familiar works are seen from a different perspective in unique interpretations. Innovative artists display the exciting and vivacious music scene of today. 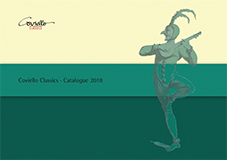 Our editions Authentic Performance, Coviello Classics, Coviello Contemporary, Coviello Bambini and Coviello Special cover the entire spectrum of sophisticated music productions.